In My Head Studios: Now With 100% More Fiber: Show Opening Tonight! Now With 100% More Fiber: Show Opening Tonight! As you well know I am first and foremost a paper artist even though a lot of my work ends up being many mixed medias. One medium, however, has always stumped me. Occasionally I might delve into the world of fiber for a small piece of some other work - a stitch here or there. But it's never the main ingredient. Something about that has bothered me of late. There is a frontier yet unexplored. My internal mad scientist cannot deal with frontiers left unexplored. So I am driven to follow the road down to that horizon and see what's there! With me on my journey is one of my favorite people and artists of all time - Leslie W. at the Creative Wellness Coalition (CWC). Her work with fiber is astonishing. She has the capacity to mold and shape the seemingly ethereal qualities of fibers and fabrics into works so fanciful and amazing that she blows my mind on a regular basis. With Leslie's help I was able to create four fiber pieces that are included in the show that opens tonight. Creating these pieces over the course of the past three weeks has changed my way of thinking about fiber and fabric. They are not such a mystery now. I've innovated myself into a place I simply must keep exploring. I love this fiber stuff! The opening tonight coincides with First Friday here in Rochester. This is an event where most of the galleries and artist studios in the ArtWalk/Neighborhood of the Arts area are open. So much to see and do on First Fridays! Please join me at The Creative Wellness Gallery tonight! 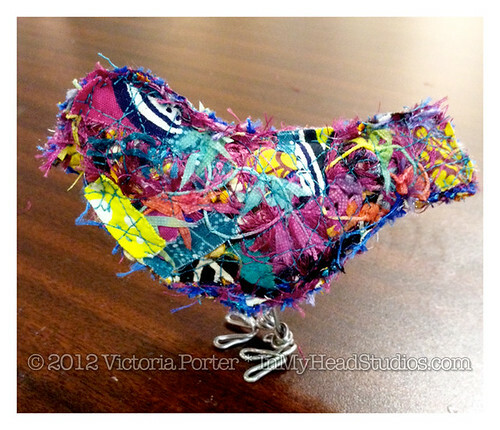 "A Celebration of Fiber Arts"